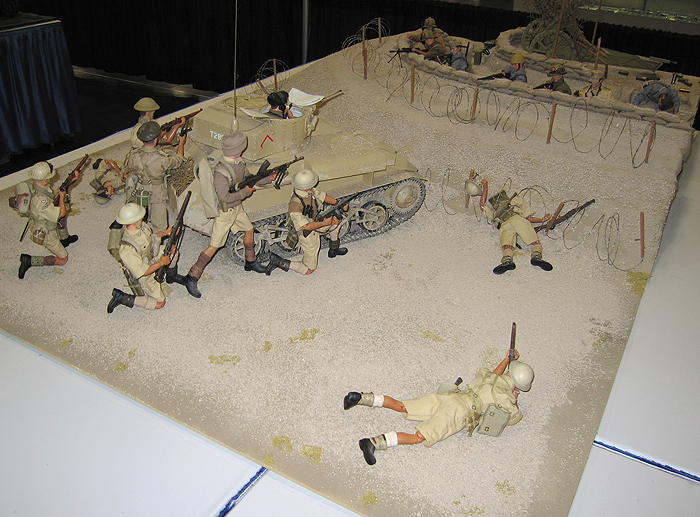 In June 2006 I attended Dragon Hobby Expo in Anaheim, California. The hobby is 1/6-scale modeling, primarily World War II subjects. 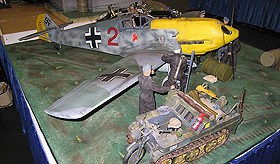 The event was sponsored by the hobby's leading manufacturer, Dragon Models Limited. My own contribution to the hobby is the 1/6 Diorama Depot. A featured guest was Fred Treiber, a World War II vet who has the most unique wartime experience I've ever heard about. 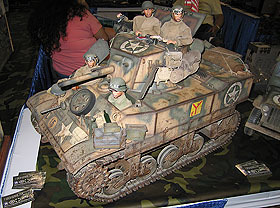 Dragon Models based a limited-edition figure on him and released it at the expo. Fred was raised in New York City by German immigrant parents. While studying music in Berlin on a scholarship, he was drafted by the Third Reich. He served in both the navy and army. 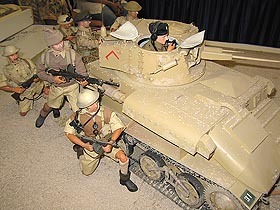 As a Gebirgsjager (mountain trooper), Fred saw intense combat action on the Eastern Front. 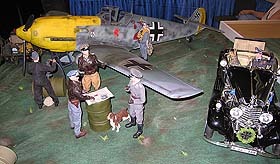 He received awards and commendations, including the Iron Cross. 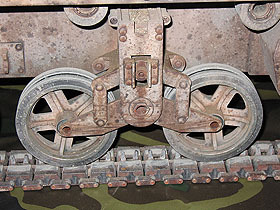 During his military service he was court-martialed for insubordination, was pursued halfway across Europe by the Gestapo for giving up his trolley seat to a Jewish woman, and escaped from a French POW camp--twice. As a major history buff, I was tremendously honored to spend time with Fred and hear dramatic true tales told by one of the good "bad guys" of WWII. 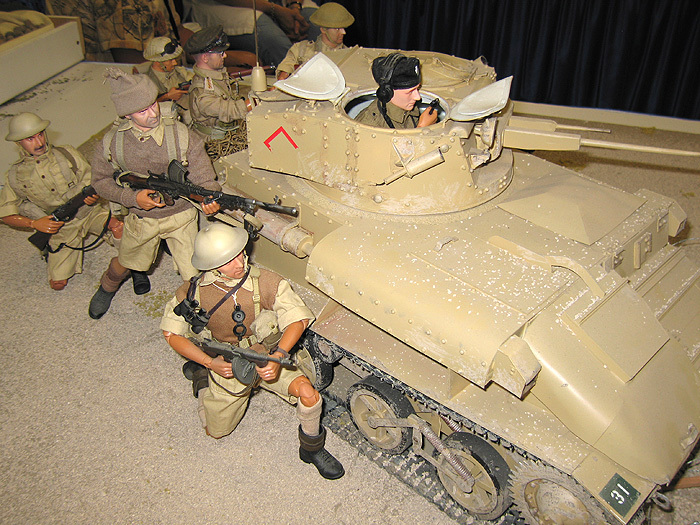 Living history at its finest. Here I am, wearing the expo's official T-shirt, with Patrick Kiser, a historian and re-creationist who serves as a consultant to Dragon Models. 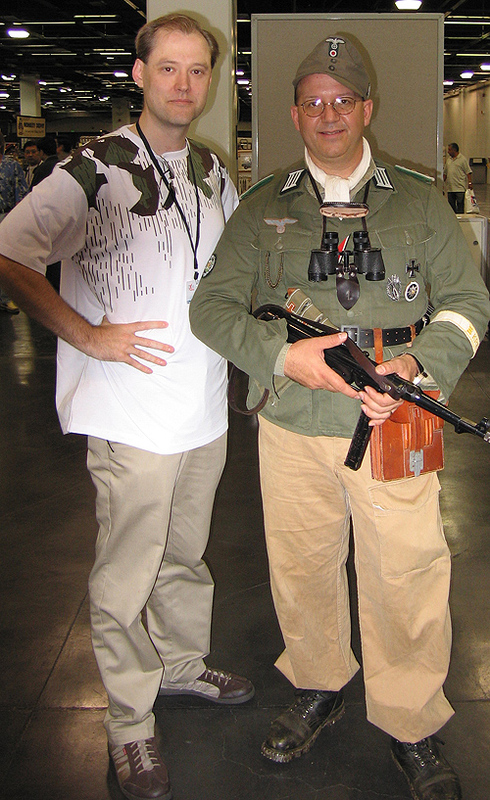 He's wearing a tropical version of the Gebirgsjager uniform. 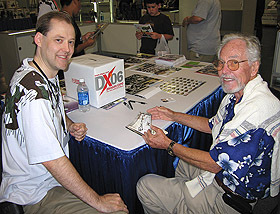 Patrick is not only a friend of Fred Treiber's, but also provided Dragon with the reference needed for the special figure (below). 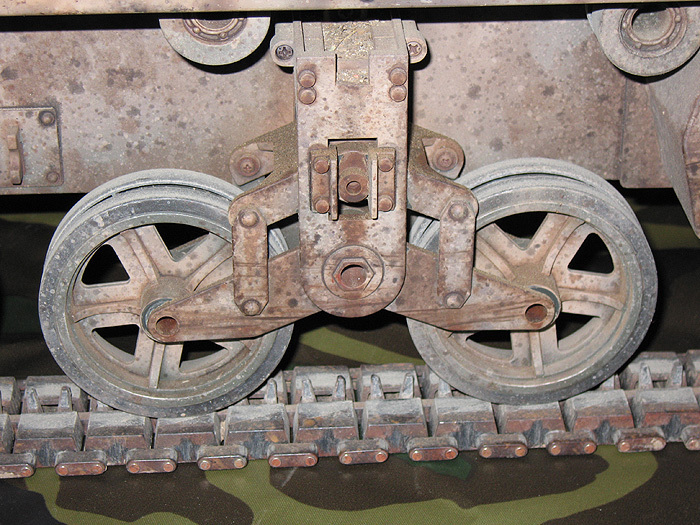 Above is a kubelwagen, the German army's "jeep" (revived by Volkswagen circa 1970 as "the Thing"). It has been customized as a repair car with built-in tool boxes and a folding work table. 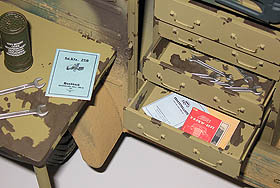 The manuals seen in the drawers and on the tabletop are my creations, from the 1/6 Diorama Depot. 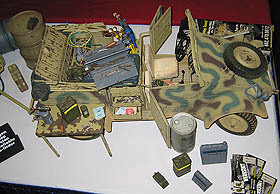 The vehicle was modified by Die Werkstatt, one of the top accessory manufacturers in the hobby, which provides kits for turning Dragon's kubelwagen into a repair vehicle. Die Werkstatt is run by my two new pals, Alison and Rick Ivansek. A wide assortment of figures, accessories, and vehicles were on display and available for purchase. 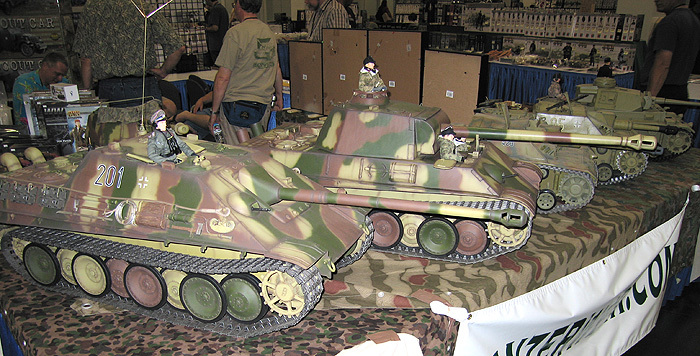 How do you suppose folks got their massive 1/6-scale tanks home? FedEx had a booth at the expo, of course. 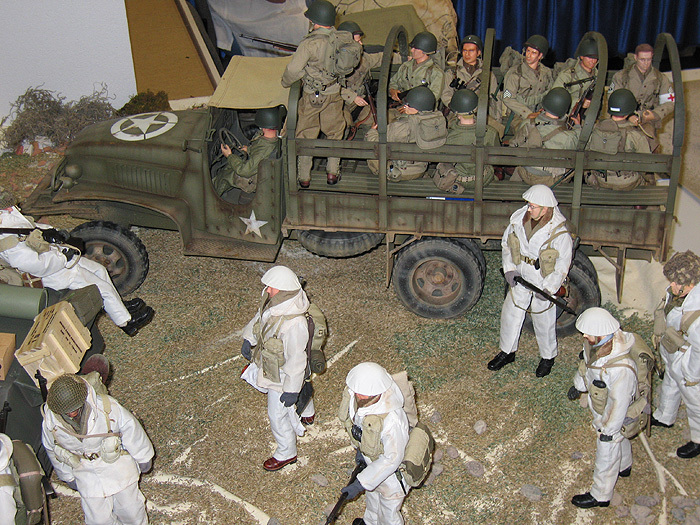 In addition to the several 1/6-scale dioramas seen here, there were dioramas in 1/35 and other scales. Some of them were mind-blowing! Official photos of the expo are onilne at the DX06 web site.